If you’re lucky enough to have visited a few national parks, then you know how each one is filled with a tremendous number of natural wonders, and a list of attractions a mile long. You also know that each park has that one defining characteristic. They all have that one attraction that can’t be missed, and it’s that experience that turns a trip into a pilgrimage. For Haleakala, the Maui National Park, that experience is the sunrise. Haleakala actually means “House of the Sun,” and legend has it that the demigod, Maui, captured the sun there to help lengthen the day. Clearly, there is no better place to witness a sunrise than the summit of Haleakala. The dormant volcano has an elevation of ten thousand feet, and it is the highest peak in Maui. It offers unobstructed views for miles, and its secluded spot keeps it safe from invasive light pollution. 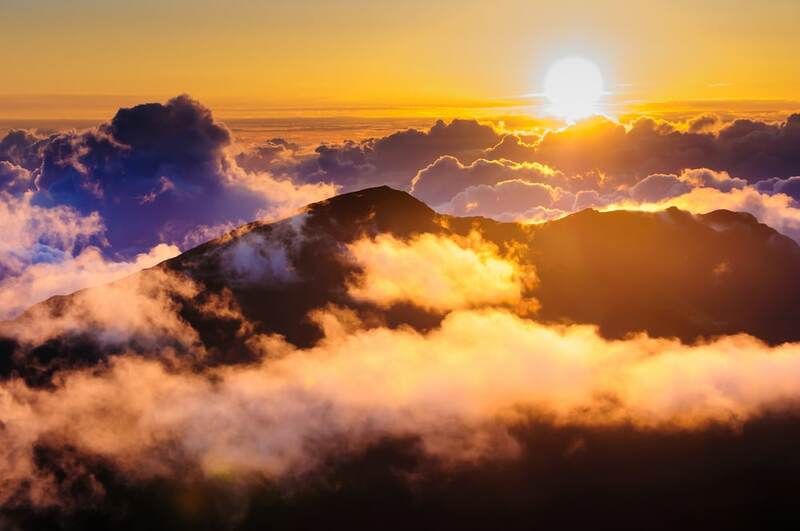 While there are plenty of activities that demand your attention during your time in Hawaii, from visiting Oahu National Parks to the many other island parks, a sunrise on Haleakala is an experience that can’t be missed. The setting couldn’t be better to watch the sunrise, but you have to make sure you follow a few simple tips to ensure that you can make the most of it. Here are three ways to make sure you see the perfect Sunrise at Haleakala National Park. A sunrise seems like a funny thing to make a reservation for, but at Haleakala, it is a necessity. You will not be allowed up to the summit to see the sunrise unless you have a reservation, so before you start making grand plans, make sure you have a spot. This is due in part because the sunrises are so popular, and because there is limited space for parking. It’s also to help keep the experience as peaceful. Parks must always find ways to balance people’s interest in nature with the preservation of nature, and requiring a reservation is part of that effort. You will need a reservation to enter the park from 3AM until 7AM, daily, and you can reserve a spot tow months in advance, and as close as the evening before. A reservation is required for each vehicle that enters before 7AM, and it will cost you a $1.50 per vehicle. It might seem strange to pay for the privilege of watching a sunrise, but once you witness it, you’ll realize $1.50 isn’t nearly enough. After all, the sunrise itself is priceless. To native Hawaiians, the mountaintop is sacred land. Visitors are frequently reminded by park officials, and tourist websites to remain quiet and respectful when watching the sunrise. It’s not only polite etiquette, but it’s also just really good advice. Remember, you are there to commune with nature. You might not reach any sort of personal epiphany, and there’s no guarantee that the surrounding landscape will change your life, but you should at least give it the opportunity. For that, you might try unplugging a bit. Obviously, you want a good camera with you to snap some photos of the amazing sunrise, but after you’re satisfied with your photography work, try putting your camera, and your phone, away. Observe the sky. Take a deep breath. Watch the clouds roll in. Feel the cool wind and the warmth of the light. Smell the air. Think about how you are standing on a dormant volcano. Yeah, think about that for a moment. Remember the raw and beautiful power of nature. Be present. Be in the moment before the sun gets drawn up into the sky like a blind, and the day becomes ordinary again. There is a paved road that stretches from the park’s entrance up to the summit of Haleakala, so it’s easy to take a car there and back, but there are some more exiting ways to do it. Several companies will shuttle you to the summit to see the sunrise, and then provide you with a bike and riding gear so that you can make your way back down to sea level. The twenty-three mile bike ride down the mountain is self-paced, and it gives you plenty of opportunities to pull over, hop off your bike, and take a few more photos. It’s a one of a kind adventure that starts with a serene sunrise, and ends with a thrilling trek down the mountain. It’s a great way to harness the invigorating energy that watching the sunrise will give you. You can take your time meandering down the mountain, and if there are some in your party that would prefer not to bike, the shuttle service will drive them down. Now that you’ve got three great tips for how to enjoy a sunrise at Haleakala National Park, you don’t have to worry that you will miss out on a great experience. You’ll be sure to be there as the sun rises over the ocean, and you just might find yourself a little changed from seeing it.